are certain to leave you, your loved ones, and your pet bird singing and whistling with joy. The well-recorded cassette tape, real-time copied on high bias tape with Dolby B noise reduction for greater fidelity, contains sixteen classical and popular vocal selections. It is available for $9.95 (CA residents add up to 9.75% sales tax, depending upon your local tax rate) plus $2.50 postage and handling. The CD contains the same music as on the cassette plus one bonus selection. It is available for $14.95 (CA residents add up to 9.75% sales tax, depending upon your local tax rate) plus $2.50 postage and handling. Jason is currently in transition between homes. You can pay by Paypal, check or money order. Please write him at healrmn@planeteria.net for further information, and put “Whistling Inquiry” in the subject line. Because Jason is sometimes on the road, please allow up to two weeks for a reply. 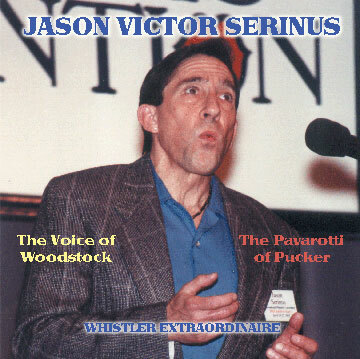 For some of the titles found on Jason's cassette, please scroll to the bottom of the whistling page. Whistling samples may be added to this website at a future date.